Polished Indulgence: Color Club Revvvolution = Happy Holo-ween! Happy Holoween (or Holowe'en, whichever you prefer)! (Yes, Spelling and Grammar Nazi, I spelled it wrong and it's for good reason. Bear with me for a bit.) While I'm not exactly a huge fan of the holiday, I'll still be joining in on the festivities and handing out candy tonight. I'm really excited to see the little trick or treat-ers and what costumes they'll have on! Last year, we even got a two year old boy dressed as a pumpkin who was trick or treat-ing with his father. His dad would ring the bell for him and move to the side so that when the homeowner opens the door, he'll see only the cutie pie. Funny how we had some decor at the door and the poor kid was too spooked, he didn't want to go up to the door alone! So we're laying off any spooky decor this time in hopes we'll see him again this year. Hammie says he's got the perfect costume for the party he's going to (he didn't even invite us along, boo!) and he can't wait to wear it. He said he'd show it off at the end of the post; the suspense is killing me! But before you think about jumping to the end of the post, let's take a look at how Halloween become Holoween. That's what a dark rainbow looks like. Note(s): This polish came out in 2009 from the Femme Fatale Collection and it's one of the better known black holographic polishes, along with OPI My Private Jet. I've heard that some bottles might be duds in that they don't show the holographic effect very well, so be careful about purchasing this polish sight unseen. I'm not sure if it's just the older Color Club polishes that have this on the cap as my newer ones don't. Good sized brush with a plastic handle. We all know I'm not partial to full on black. But a black holographic polish? Yes, please! The base is definitely black but the holographic particles make it look more like a speckled gunmetal grey, especially in the shade. I have to admit that when I first wore this, I was a little disappointed. Even the bottle didn't look spectacular. But that was all in the shade. Wait till you walk out the door and you get an eyeful of rainbow awesomeness. Bright light does the trick too! It's so mesmerizing with all the shifting colors that I can't take my eyes off it! Don't wear this if you're planning to cheer for your husband while he's playing softball in the summer or you'll end up checking your nails out more than taking tally of the score, or even cheering for that matter. True story. Now, the holographic nature of this polish is more of a scattered holo than a linear one. What's the difference? Well, a linear holo would show it's rainbow pattern in a linear fashion a lot like this while a scattered holo shows it's rainbow pattern more randomly and without a specific form. 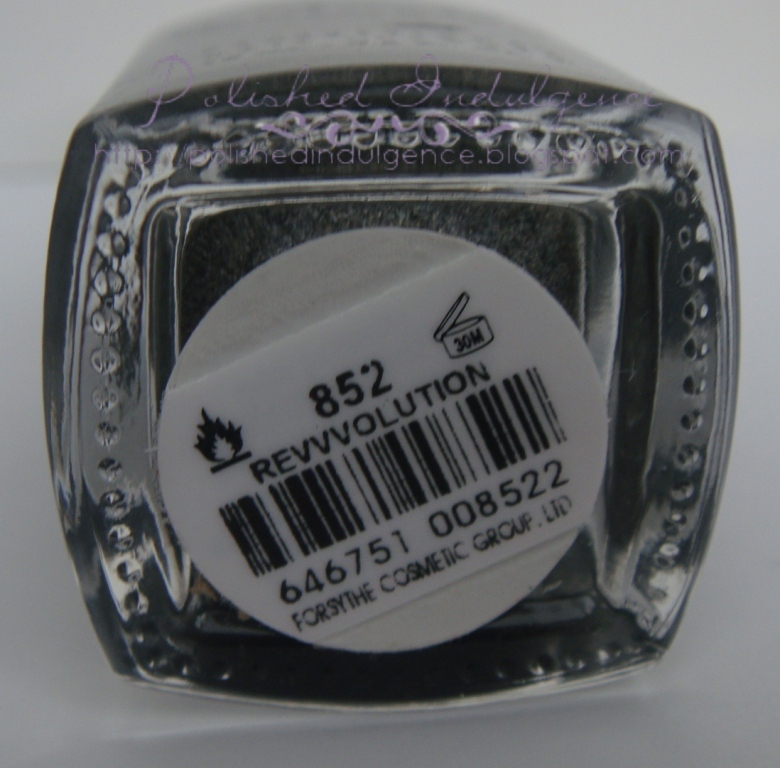 I found Revvvolution (I love saying that name!) shows more of a scattered pattern than linear and in some lights, the effect couldn't be captured properly by my humble camera. You'll understand better when you see the photos below. Also, the finish it dries to is actually fairly shiny. I actually prefer it without top coat, but if you're one of those who needs to get their shine on, top coat most definitely helps! ***All nail swatches were done with Nail Tek II Foundation Base Coat and two coats of Color Club Revvvolution unless stated. 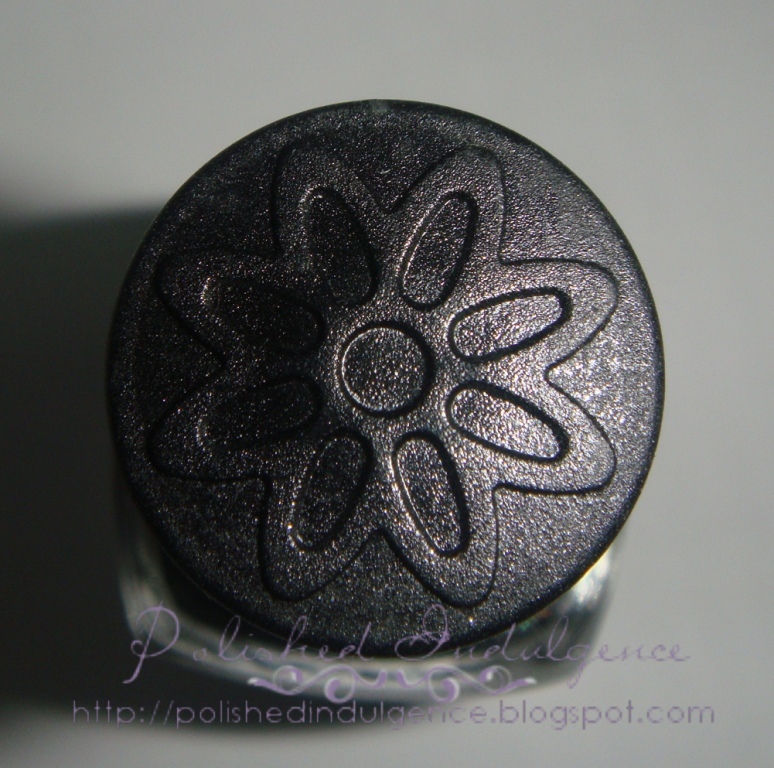 Sad looking silver speckled black polish turns into.. I was trying to capture more of the rainbow but I think it's the angle that's not helping. The standard Color Club brush is on the thinner side of the spectrum. I usually prefer brushes a bit wider, but I think it worked well with this particular polish. I like how it was pliable so I can fan it out to compensate for the thinness and I can really get into the edges without touching the cuticles. I really like the formula on this one! It was opaque in one coat. Yes, ONE coat. You've got to love that in a polish. I still did two anyway, for purposes of consistency with all my swatches. It flows really well, too, never mind that it was a little on the thick side. Needless to say application was a breeze. Dry time was fairly fast, as well, with the first nail painted on one hand dry to the touch after painting all five fingers. Never judge a polish by its color in the shade. Hammie says: I want more rainbow! Like in the bottle! Bonus Photo: Intentionally blurred (in sunlight) so you can best see the rainbow goodness of holo. I might have to get a better camera. My trusty point and shoot just can't seem to show that awesome rainbow unless it's a little unfocused. It could also be that the angle isn't right, either. Will definitely need to revisit this later on. A black holographic polish can't be all that unique, now can it? Off the top of my head, the infamous OPI My Private Jet is the first that comes to mind. The infamy of MPJ is well earned though, in that the older formula displayed a stunning (almost?) linear holo even though it was a little on the sheer side. The reformulation brought about a more opaque polish but lost most of why it was so awesome to begin with-- the holographic rainbow. Nowadays, it's hard to purchase it online as you can end up getting the newer formula that's more disappointing than anything. Color Club Revvvolution is a great replacement, in my opinion. It covers the opacity issues while retaining all that glorious rainbow goodness in a bottle. It's cheaper too, and not as hard to find. I doubt you'll see this in a brick and mortar store, as it is part of an older 2009 collection called Femme Fatale, but a lot of online retailers still carry it. I actually got my bottle for free with a coupon from a previous purchase that I got from Nail Polish Canada. Sad to say they don't carry it any more though, but other e-tailers still have it, like Head 2 Toe Beauty, for one. If you can get it for less than $3.00, good, but if you're desperate, I personally wouldn't pay any more than $10.00. I can, however, assure you that this holographic lovely is worth the price as I can also use it in stamping nail art. Do you agree with how Hammie scored this polish? Did you expect to see more of that rainbow holo prettiness? What are you dressing up as for Halloween? Hammie says: Happy Halloween! What do you think of my costume? Cool, huh? Bet you didn't even see me, let alone recognize me! Posted by Carmela at 8:00 a.m.
Carolina October 31, 2011 at 9:34 a.m.
Carmela October 31, 2011 at 11:11 a.m. Thank you so much, Ms. Birthday Girl! :D Hope you're having an awesome day! 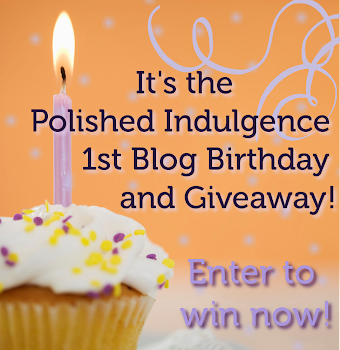 Happy birthday, again! Swatch And Learn October 31, 2011 at 6:43 p.m.
Carmela October 31, 2011 at 8:51 p.m.
Aww, thanks, Mary! You're really too nice. :) Hope you're enjoying your favorite holiday! Anonymous March 9, 2013 at 1:36 a.m.
Look at my webpage "natural right"
Anonymous June 14, 2013 at 2:06 a.m. I actually took some different ideas from this. It's really nice that you spent the time to do this. I repeatedly find myself devoting a bit too much time simultaneously reading and/or commenting. Absolutely worth the time, regardless. Anonymous June 14, 2013 at 8:49 p.m.